Interior designers in Lahore and all over Pakistan remain up to date with the latest trends when it comes to designing offices, buildings and most importantly houses. Any structure with more than one floor needs a staircase in order to move in between the floors. It is imperative to incorporate modern designs and ensure that staircases blend in well with the overall creativity displayed in the structure. Modern staircase designs have always been a vital part of the architecture of any structure. 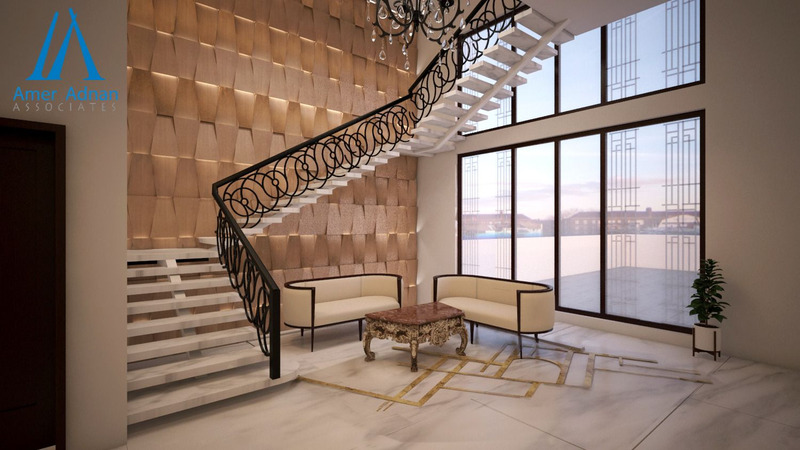 Several architects in Lahore are working towards introducing modern staircase designs in order to depict their expertise as well as creativity. Undoubtedly, a great deal of time is spent on staircase designs by an architect. Recent changes in staircase designs focus on stairs that are not too narrow. Accurate estimation of staircase height and the total slope is key to building in the design for the entire staircase elevation. As the name suggests, curved staircases imply a soft curve in a certain direction. It has a bending surface with a structure that is similar to that of a spiral staircase. Curved staircases are usually designed on larger properties such as houses that have enough and widespread spaces or for buildings such as schools and museums. This kind of a staircase has straight flights that change direction by 180 degrees and has within a place for resting at the landing. These staircases are divided by small landing portions that have a small number of stairs in order to making walking more comfortable. In half landing staircases, the stair flights are in opposite direction with no space between the flights. This is one of the few staircases that requires a great deal of creative input for its construction. It is designed to have a wide flight in the start which is eventually subdivided into narrow flights at the mid-landing. Bifurcated staircases are most commonly found in public buildings such as museums and shopping malls. It may be designed to have poles with handrails which bifurcate into dual narrow flights at the landing. This design of staircase is often found in modern design buildings. It depicts modern architect design and is becoming greatly popular in residential structures. The staircase has a turn by 90 and 180 degrees and is designed with soft flowing lines. The aim of the winder staircase design is to make it look intriguing and it has no landing until you reach the top. Winder staircase designs can have single or double winder stairs. A geometrical staircase comes into any shape or a mix of shapes and uses winders for change in its direction. The strings and rails of such a staircase are arranged on geometric principles and typically it has no common style of design. The opening of the geometrical staircase between the forward and the backward flights are curved. This is the most common design of staircase and is found in numerous residential buildings. It has no curve or turning and it is the most popular design because of its functionality. It offers great ease in moving up and down with no corners that hinder the upward climb. This is a more conventional design which is easier to install and goes easier on the budget as well.